Here's how it was envisioned. It's the opposite of Pangea! The islands are merging and sinking. Know any bankers that have a loan on this property? I bet China could have done a better job! 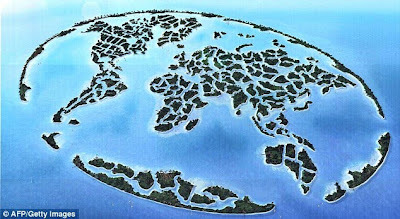 Speculative reports suggesting that The World islands are sinking are wholly inaccurate. The islands were finished some years ago and there has been no subsidence since. A system known as vibro-compaction was used to increase the load-bearing capacity of the reclaimed land mass. This process causes the soil to vibrate vigorously, minimizing the tiny air gaps between the sand particles and locking the particle corners and edges together, which in turn lead to very deliberate and calculated compaction and settlement. 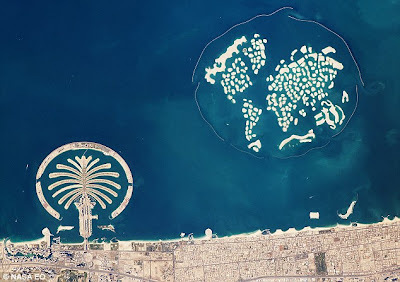 The load-bearing capacity of The World islands is about twice that of mainland Dubai. A suggestion also that some of the islands have slipped and spread into each other is also completely incorrect. 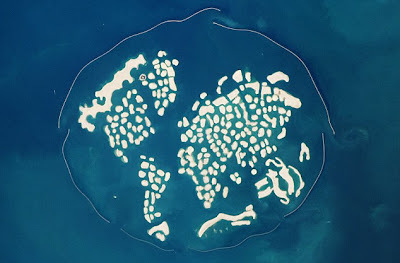 The islands at the centre of The World were merged purposely to create land for specific developments, and the shape of other islands was changed at the request of owners. We have currently sold around 70% of the islands and development has begun by a number of the owners - further testament to the fact that the islands are as solid as the rock they are built upon.